WAN Zhiying, HU Haiou ,WAN Qian, WU Zhengshan. Structural Engineer: LI Ting,XU Min,XIONG Shen,WAN Haiyang. Mechanical Engineer: HONGYing,ZHANG Xin,TU Zhengchun,XU Hong. Steel structure: Zhe JiangSoutheast Space Frame Co., Ltd.
Glass curtainwall: Shenzhen ShenZhuangZong DecorationCo., Ltd.
As a landmark of Xiamen (a big city in China), the railway station building is constructed with a two-way roof spanof 132 meters by 220 meters,which is thelongest single span length in the world that has been built. 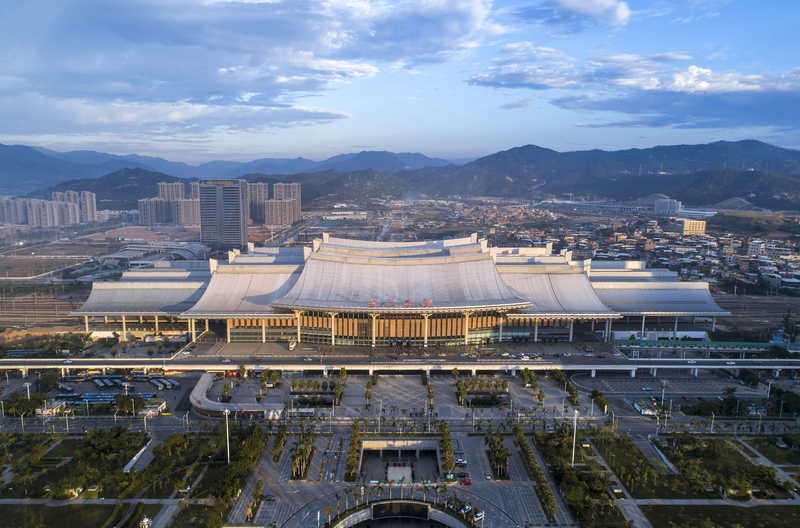 The utility of lightweight and highlystretchy Megastructure, which is the large span steel structure using spatialtruss supporting cured-surface space frame, ingeniously reflects the“swallow-tail ridge” imagery of local residence in South Fujian and theinheritance of regional culture. The overall image fully presents the urbanspirit and features of Xiamen. Close integration and seamlessconnection with the urban transportation make the passenger transfer easily andconveniently. 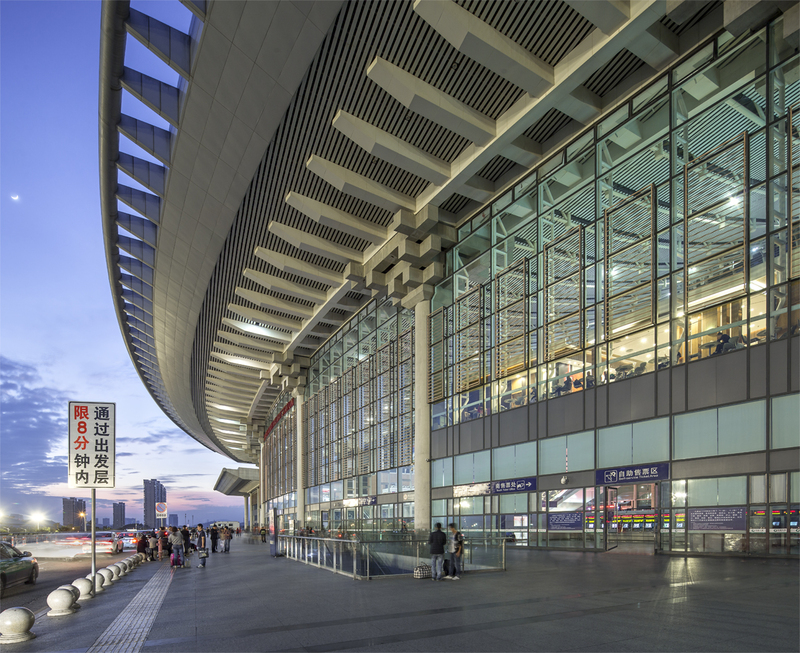 Professional and high-efficient plansrepresent characteristics of railway station in Chinese metropolis. The large-span column-free space isclear and readable, offering a through view and strong visual guidance. Thepassengers inside the station have full understand and clear idea and controlof their route. By using the “swallow-tail ridge” oflocal residence in South Fujian, the architectural form not only reflects thelocal culture features, but also fully reflects the true and reasonablestructural load bearing at the same time. A light roof reflecting the aestheticof structural mechanics is created by using the spatial-truss-supportedcurved-surface space frame structure system. 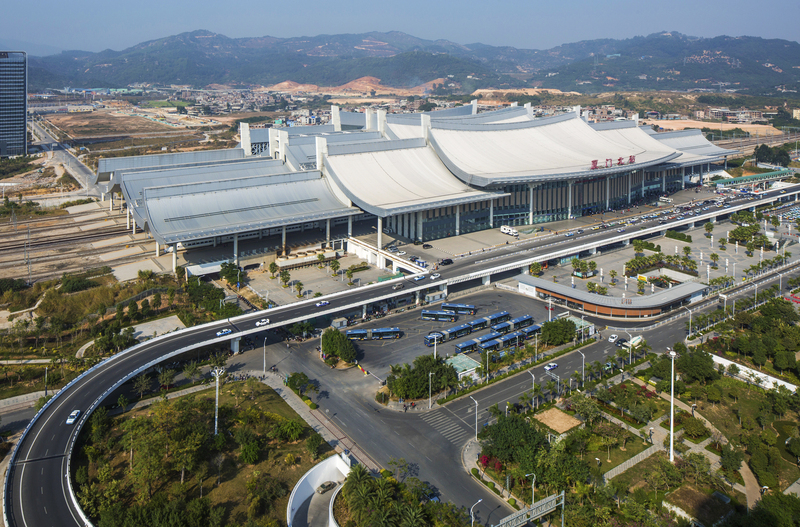 The main roof span at 132 metersby 220 meters is the longest single span in the world among those railwaystations already constructed. 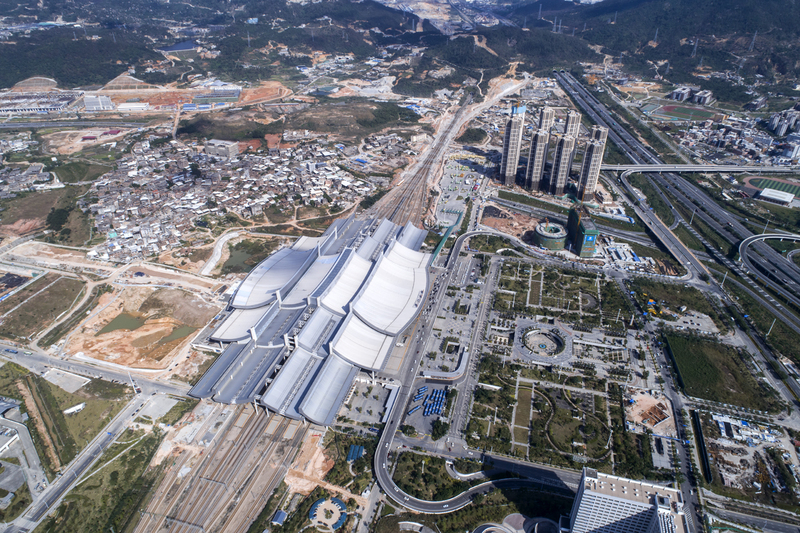 shading system, ventilation system andthermal pressure driven natural ventilation system are applied to the new railway station. The megastructure system that isspatial-struss supporting curved-surface frame is a perfect combination of thearchitecture imagery and structure, ingeniously reflecting the features of the “swallow-tailridge”of local residence in South Fujian. Four large-span spatial steel truss arrayalong the roof ridge with both ends of the steel trusses supported on the giantA-shape steel reinforced concreted tower columns. These together constitute thegiant composite frame and form the main load-bearing system and double lateralforce resistant system of the roof. 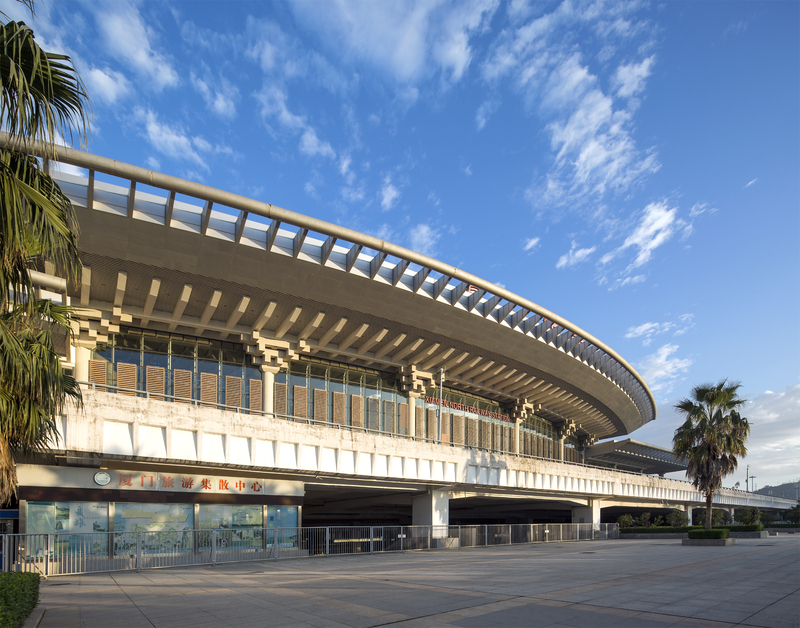 The station building’s two-way roof spanis 132 meters by 220 meters. The architects have fully considered the real andreasonable structural load bearing during the architectural form creation. 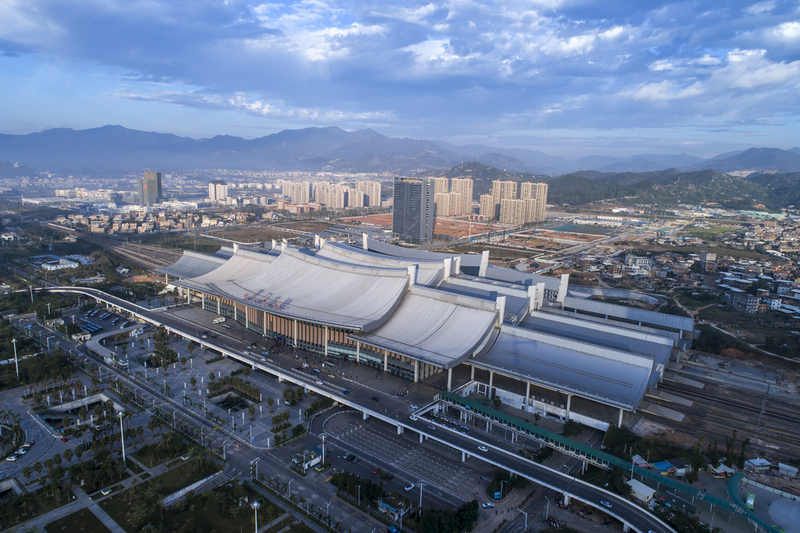 Byworking with the structural engineers, architects created the advancedstructure technologies like the structure system of giant A-shape tower column,giant composite frame and roof space frame consisting of two-way intersectiontrusses with unequal heights. 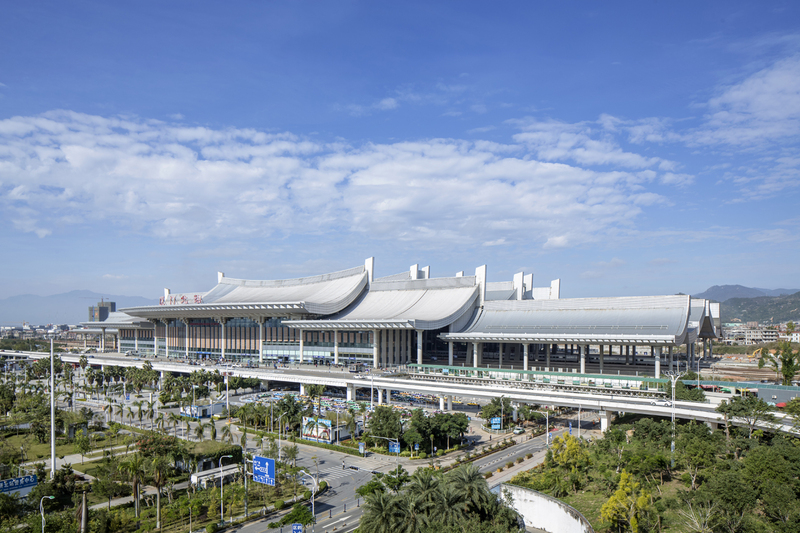 With the roof structure steel consumption indexcontrolled at 99kg/m2, it becomes a railway station building with the longestsingle span in the world among those already constructed with very economicalindexes. It has been awarded with the Outstanding Structure Award of 2015 IABSE(International Association for Bridge and Structural Engineering). The step-down slope roof that is highin the middle and low on all sides and the electrically operated skylights areadopted. 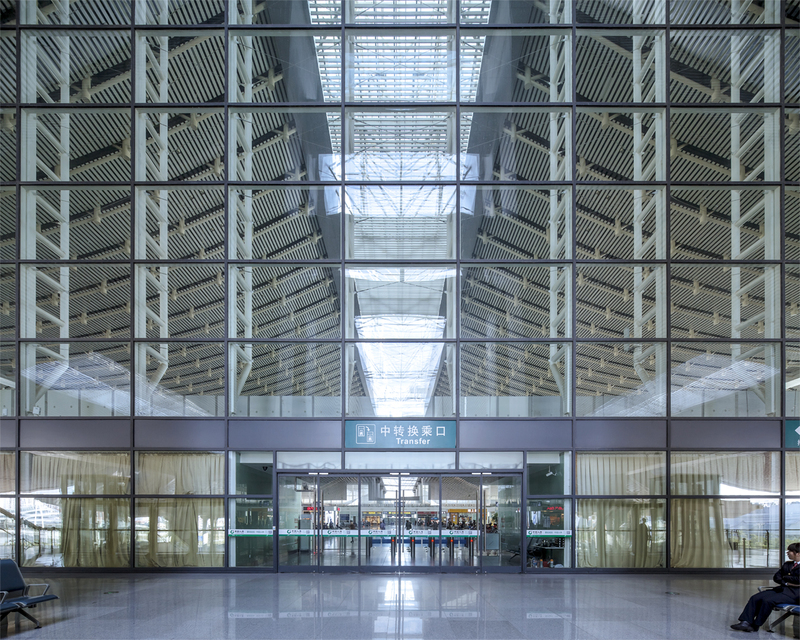 The good natural ventilation is realized by using the thermal pressureventilation principle and the uniform daylighting illuminance is achieved byarranging the skylights dispersedly. GMT+8, 2019-4-19 13:17 , Processed in 0.028602 second(s), 24 queries .